I had heard quite mixed reviews of this novel but it was on the staff picks shelf at the very lovely Mr B’s Emporium of Reading Delights in Bath so I took a chance. I can see why it has divided people. As the blurb says, “it wears its darkness lightly”. The set-up is that familiar one of the middle-class English family holidaying in a villa on the French Riviera when a stranger intrudes. Or is it? There are clues throughout that things are not what they seem and to the last page I was not sure if all or any of the events recounted had actually happened. “He leaned his head out of the window and felt the cold mountain air sting his lips…They knew the past lived in rocks and trees and they knew desire made them awkward, mad, mysterious, messed up…He asked her again to please, please, please drive him safely home to his wife and daughter. What it appears to be is the story of famous poet Joe Jacobs and his absent war correspondent wife Isabel, whose marriage is breaking down. But there’s also their teenage daughter Nina, childlike for her 14 years but trying to be one of the adults. And there’s family friends Laura and Mitchell, a couple who run a boutique shop in London and who never seem comfortable in this holiday setting. And then there’s Kitty Finch, the stranger who turns up floating naked in their outdoor swimming pool, unembarrassed by her nakedness or the apparent mix-up that has brought her there. There are some plot threads that seem so inevitable that Levy has put their conclusions on the first page to save the reader wondering. Yes, we do have a philandering husband and a beautiful, strange young woman thrown in his path. Yes, we do have characters dealing with depression and thoughts of death. And if you take it all at face value then you might say that what happens is no more than the sum of these parts. But I think that the writing demands more of its reader. There are two obfuscating themes: identity and fiction. Joe, we learn early on, is Jozef to his wife, JHJ to his readers. Everyone lies or withholds information or tells different versions of the truth. Not only is Joe a poet, but Kitty is an aspiring writer eager for his opinion of her work, and then later in a section told from Nina’s perspective there are short poems thrown into the narrative as if she, too, is a poet, an inventor of fictions. Characters seem to repeat each other’s words or actions as if the novel is being rewritten even as you read it. Add to all this that two characters have a history of depression and related illnesses and a third character is constantly stoned, and you have yourself a thoroughly unreliable narrative. What seems like a quick, easy, fluid read becomes so much more than the sum of its parts. Published 2011 by And Other Stories. Shortlisted for the Man Booker Prize 2012. I found this book hard to read and I’m finding it hard to write about, but I don’t want to give the wrong idea. It’s hard in a brilliant, literary way. And it’s sort-of SF. Which I took a while to twig to. In a big Jewish settlement in Alaska (that should have been my first clue that something was askew), detective Meyer Landsman is called in to the scene of a murder in the very same seedy hotel that he lives in. The dead man was a junkie who played chess – and that’s all anyone seems to know. Landsman’s lifelong love–hate relationship with chess has him intrigued by the case but he is almost immediately told to drop it by his boss, who is also his ex-wife. She is tidying up loose ends before administration of the Sitka district is handed back to the USA, as the Jews’ 50-year lease on the land is about to end. There is so much going on this novel and it’s all wrapped up in gorgeous language, a combination of the purple prose of, say, Raymond Chandler, and Yiddish. Yes, Yiddish, which I am not so learned in, I must admit. And there’s also a fair selection of outright obscure words (a “hortatory cigarette”, anyone?). Which makes for brilliant quotes (I have marked so many pages in this book) but does not allow a quick read. Landsman of course does not drop the case and drags in his partner for good measure, a half-Native-American, half-Jew called Berko Shemets. Which gives Chabon the opportunity to discuss the effect a sudden mass-immigration of Jews immediately following the Second World War might have had on the local Alaskan population, not to mention on US politics in general. Social history, race, religion and culture are central to the story. The Jews are split between the averagely devout, the really devout, or “black hats”, and the…lapsed. Unsurprisingly, Landsman is the latter. He is your typical detective – divorced, family all dead, a drunk, without faith, obsessive about his work and he chain smokes. He loves his friend Berko but is not above using him badly. He also (and/or perhaps Chabon) has a wry sense of humour. Despite the familiar trappings of a typical whodunit, with an action-packed story and a variety of bad guys who are linked in various ways, this is not a rip-roaring read because it is just too complex for that. I found it hard to follow and I am honestly sure if this was deliberate or if it was me struggling with the language. There are definitely facts held back, not fully explained until later. And the characters, while being realistically unstraightforward, are kept at a distance, because we effectively experience the story from Landsman’s perspective and he is almost perpetually drunk, so it’s tough to get to know even him. This novel is to some extent an intellectual exercise. There’s more than one “What if” scenario being played out, but there’s also a lot of general information about Jewish tradition, history and culture, some of which I felt I was expected to already know, to recognise from page one and be at home with. Add to that all the chess discussion and there was a fair bit of this book passing me by. But I kept going, because though I found it tough, I also found it beautiful, in a rough and dirty sort of way. First published in Great Britain by Fourth Estate in 2007. Winner of the Hugo and Nebula awards in 2008. Sunday Salon: Do you read prize winners? On the back of this week’s announcement of the Booker Prize winner, I was wondering how much note people take of literary prizes. 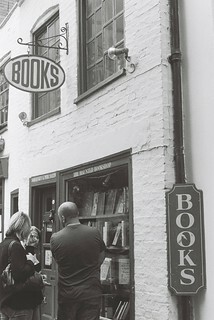 Are they just an excuse for bookshops to promote certain books? Or are they a valuable exercise in weeding out the best books from the thousands published each year? I don’t follow any prizes closely enough to make a point of reading their long or shortlists every year, but there are certain prizes that have winners that tend to fit my taste. I find hype generally puts me off a book, but later I’ll come back to them and agree that the judges did a good job. And I do think it’s a great opportunity for small publishers to get their books out in the public eye and into all the bookshops, something they normally struggle with thanks to lack of the big bucks when it comes to marketing. Launched in 1969, given to “the best novel of the year written by a citizen of the United Kingdom, the Commonwealth or the Republic of Ireland”. Of 47 winners, I have read 11 and have a further four in my TBR. (That may not sound like many but all the ones I’ve read were published within my lifetime.) And I have had several other books on the list recommended to me. Launched in 1996, given to “the best full-length novel written in English by a woman of any nationality”. Of 17 winners, I have read seven. I never used to pay that much attention but the last two winners have been two of the best books I have read this year – The Tiger’s Wife and Song of Achilles. Launched in 1917, awarded for “distinguished fiction by an American author, preferably dealing with American life”. Of 85 winners, I have read nine and have one on my TBR, but again I have had several recommended to me. I keep meaning to pay more attention, but that clashes a little with my intention to look beyond the UK and US in my reading. Launched in 1953, awarded for “the best science fiction or fantasy novel published in English or translated into English during the previous calendar year”. Of 64 winners (including Retro Hugos), I have read nine but I think we (by which I mean mostly Tim) own at least half, probably the SF half. And that’s probably also how many I’ve had recommended to me (largely by Tim, who has probably read them all, or at least significantly more than me). I have to say I’m a little surprised that JK Rowling won it in 2001 (actually, I know for a fact that Tim hasn’t read that one). I was also surprised to see that the book I’m reading right now, Michael Chabon’s The Yiddish Policemen’s Union won it in 2008 (okay, Tim hasn’t read that one either). This is not mentioned anywhere on the book jacket. Had it been, I might have found myself less confused when it turned out to be an alternative history. I wonder why the publisher didn’t choose to publicize this, when they did do that awful three pages of quotes thing at the start. Launched in 1966, awarded for “the best science fiction or fantasy novel published in English or translated into English and released in the United States”. Of 48 winners, I have read seven. The winners overlap quite a lot with the Hugos. In fact, The Yiddish Policemen’s Union also won this award and again this is not advertised on the book jacket. Methinks the publisher (HarperCollins) doesn’t want people put off a “literary” author by the idea that he has written SF. Clearly, my bias is for novels, mostly literary ones. I include those last two prizes not only because I am actively trying to read more science fiction, but also because I know it is often discussed that the big literary awards occasionally include historical or crime fiction but never science fiction, not even in the shortlists. There is a certain anti-SF snobbery. So which prizes (if any) do you follow, and how closely? 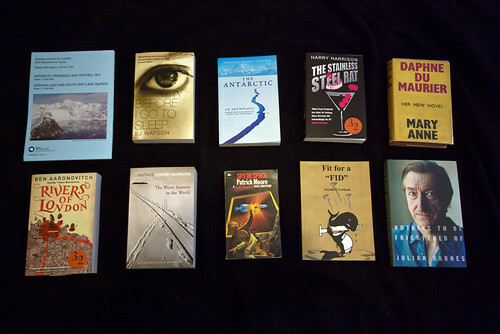 Do you read the whole longlist? Are you more likely to buy a book if it’s won a prize? If I had had any spare time at all this week I would have blogged about this sooner but I didn’t so I didn’t. Hey ho. It’s Bristol Festival of Literature time! I’ve been to two events this year, both of which were great. On Sunday I ventured into Redcliffe Caves to hear Bristol Writers Group read aloud a series of chilling tales. It’s a wonderfully atmospheric location and organisers had done a great job of lining the route from Redcliffe Wharf entrance to the big cavern with candles so that we didn’t even need the torches we’d been advised to bring. (We did need the sensible shoes and camping chairs, though. Glad I was reminded of that advice!) The stories were generally excellent and well chosen for the location – occasionally spooky but mostly choosing more real-life chills than supernatural. (I’m afraid I didn’t take notes of any of the writers’ names. Poor journalism, I know.) And I now want to do a proper tour of the caves even more than I did before. The second event was at the Thunderbolt pub and entitled “Satire and the city”. Local authors Mike Manson and Jari Moate talked about Bristol, comedy and the subjects that interest them. The title was a little misleading in that satire was not specifically discussed, though it was there to some extent in some of the excerpts they read from their books. Perhaps I need to read one of their books to find out if it was just an accurate description of them as writers. I’d be happy to do that; both were interesting, funny speakers. And another great venue that I’ve been meaning to go to for years and never made it to before. Bristol Festival of Literature continues until this Sunday, including a big day of many events on Saturday, so there’s still a chance to join the fun. And for more bookish fun, tomorrow it’s also Bristol-Con, which was great fun last year. This collection of short stories was picked by my book group. The title gives a clue to its overarching themes and I had an inkling that Munro was well known for her short stories, but otherwise I didn’t know what to expect. I have an idea that she is a bit of a national treasure in Canada so apologies for my cluelessness. The stories all deal with relationships, of all kinds – couples, siblings, extended family, friends, acquaintances; even the brief relationships established with strangers under certain circumstances. There is nothing fantastical, or showy, or even hugely eventful (though things do happen that with another writer at the helm could be dramatic, or melodramatic). Munro’s style is quiet, understated, acutely observed but not in the biting, sarcastic manner of many a younger writer. She is generous to her characters, reserving judgement even as she reveals their flaws. Every story stands up to scrutiny; in fact they are almost certainly improved by it. At book club we all had different favourites and all enthused about each other’s choices. We did all have reservations about the first story, from which the collection takes its title. While clever and interesting, it did not have the everyday feel of the other stories. It starts with a woman arranging to ship furniture across Canada, then tells us who she is and why she is doing it, then continues her story, but it skips perspective several times, zooming in on a character for a few pages at a time. At 54 pages it is the longest story in the book and possibly the most experimental. It certainly intrigued me but also frustrated me, which was actually a reaction I had a few times. Brilliantly, you could just as easily argue that little or nothing happens in these stories, or that too much happens. Those mundane details of everyday life that Munro picks out can seem so inconsequential, yet at the same time you realise that the characters’ concerns are often the same as your own so-called disasters. It is difficult balancing guilt at having moved away from family and the need to build your own independent life and it is galling when someone plays on your guilt. This is one of many examples where Munro seems to take a side, only to give sympathetic ear to the other side of the debate later on, often in another story. To balance the unwanted family guest, there’s a very sick man who could really do with his family making the effort to visit. That, incidentally, comes in the final and for me most emotionally engaging story, “The bear came over the mountain”. Published 2001 by Alfred A Knopf in the US, Chatto & Windus in the UK. I know our holiday was a month ago, I have been meaning to post about this and kept forgetting/waiting for my photos to be developed. 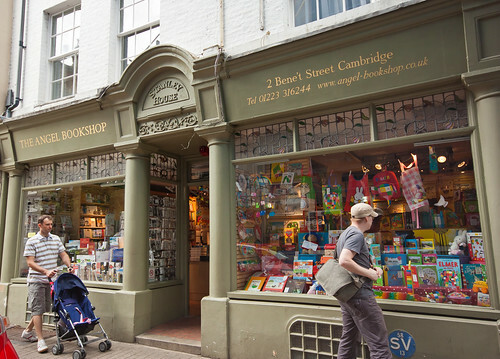 One of the many nice things about Cambridge is its abundance of bookshops. 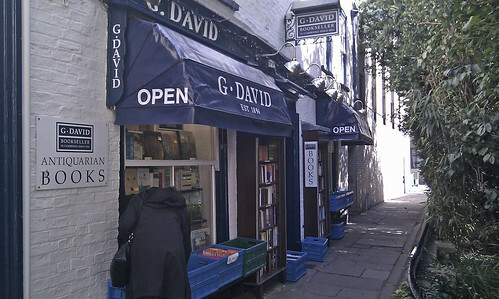 In these times of bookshops, both independent and chain varieties, closing left, right and centre, it’s good to know they’re flourishing somewhere. 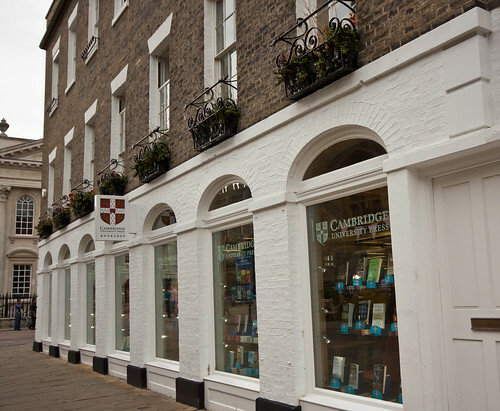 I particularly liked Heffers bookshop, which is owned by Blackwells and reminded me a lot of their very excellent Oxford branch. Sadly my photo of that storefront came out particularly badly. Of course, we couldn’t resist buying something in each of several of these lovely lovely shops. I really must stop buying books for a long while now! Here are just some of our purchases. See if you can guess which are for me and which for Tim, though I should warn you that to be crafty some were for both of us. It’s good to share.